The Court of Appeal yesterday refused a motion for the matter filed to have an appeal for New York-based murder accused Marcus Bisram to be heard urgently. The court instead ordered the applicant, Shermelia Inderjali, who is Bisram’s mother, to pay costs in the sum of $250,000. She had through, Attorneys-at-law Siand Dhurjon and Sanjeev Datadin, approached the Appeal Court seeking an order to overturn a ruling by High Court Judge Navindra Singh. Justice Singh had ruled against an application to have murder charge against Bisram thrown out. 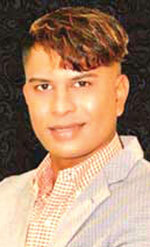 Justice Singh’s decision was given in proceedings brought by way of a Fixed Date Application in November 2017, in which the applicant sought two prerogative orders against the Director of Public Prosecutions (DPP) to prohibit any further proceeding to prosecute Bisram for the murder of Faiyaz Narinedatt on the ground that so to proceed would be irrational, unreasonable, an abuse of power, capricious. The Court was also asked for Order or Rule Nisi of Mandamus compelling the DPP to wholly withdraw and discontinue the charge against Bisram on the said grounds. Following a hearing in the High Court, Justice Singh refused the orders sought and dismissed the application. However, the decision taken by the Judge was appealed and an application to have the matter heard expeditiously at the Appeal Court was also filed. The application for urgent hearing was considered following arguments presented by attorneys representing Bisram and Solicitor General Kim Kyte and State Attorney Stacy Gooding. The motion was heard by Justices of Appeal, Rishi Persaud, Rafiq Khan and Arif Bulkan. Yesterday, the Court delivered a ruling in which it outlined that the applicant failed to satisfy the criteria set out for matters to be heard expeditiously. In handing down the ruling, the Court pointed out that given a number of prevailing realties, speedy justice for an individual must yield considerations of equity and even handed treatment of all; the applicant on behalf of Bisram failed to satisfy those grounds. In the circumstances, the Court noted that the appeal against Justice Singh’s ruling must take the normal course. Bisram, a Guyanese multimillionaire based in New York was charged for the murder of Berbice carpenter Faiyaz Narinedatt. In November 2016, Narinedatt, was beaten after he allegedly rebuffed Bisram’s sexual advances. The carpenter was allegedly dumped in the trunk of a car belonging to an acquaintance of the businessman, driven to a public road in Berbice, and the scene made to look like a hit-and-run accident had taken place. The case has taken several turns with a number of persons implicated for attempting to thwart the course of justice. Some were placed before the court for allegedly offering the police bribes on behalf of the wealthy New York-based businessman. Meanwhile, Bisram is fighting extradition proceedings filed in a US Court. New York Judge, Peggy Kuo, filed the Certificate of Extraditability and Order of Commitment, paving the way for Bisram, who was arrested at a New York beachfront property, in Far Rockaway, Queens, on July 4, 2017 to return to his native Guyana.